More than 50 research studies worldwide have found that certain types of news coverage can increase the likelihood of suicide in vulnerable individuals. The magnitude of the increase is related to the amount, duration and prominence of coverage. Risk of additional suicides increases when the story explicitly describes the suicide method, uses dramatic/graphic headlines or images, and repeated/extensive coverage sensationalizes or glamorizes a death. Suicide is a public health issue. 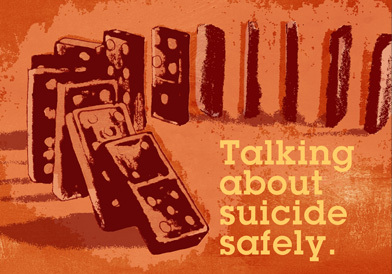 Media and online coverage of suicide should be informed by using best practices. Some suicide deaths may be newsworthy. However, the way media cover suicide can influence behavior negatively by contributing to contagion or positively by encouraging help-seeking. Suicide Contagion or “Copycat Suicide” occurs when one or more suicides are reported in a way that contributes to another suicide. References and additional information can be found at: www.ReportingOnSuicide.org. Big or sensationalistic headlines, or prominent placement (e.g., “Kurt Cobain Used Shotgun to Commit Suicide”). Inform the audience without sensationalizing the suicide and minimize prominence (e.g., “Kurt Cobain Dead at 27”). Including photos/videos of the location or method of death, grieving family, friends, memorials or funerals. Use school/work or family photo; include hotline logo or local crisis phone numbers. Describing a suicide as inexplicable or “without warning.” Most, but not all, people who die by suicide exhibit warning signs. Include the “Warning Signs” and “What to Do” sidebar (from p. 2) in your article if possible. Investigating and reporting on suicide similar to reporting on crimes. Report on suicide as a public health issue. Quoting/interviewing police or first responders about the causes of suicide. Seek advice from suicide prevention experts. Developed in collaboration with: American Association of Suicidology, American Foundation for Suicide Prevention, Annenberg Public Policy Center, Canterbury Suicide Project – University of Otago, Christchurch, New Zealand, Columbia University Department of Psychiatry, ConnectSafely.org, Emotion Technology, International Association for Suicide Prevention Task Force on Media and Suicide, Medical University of Vienna, National Alliance on Mental Illness, National Institute of Mental Health, New York State Psychiatric Institute, Substance Abuse and Mental Health Services Administration, Suicide Awareness Voices of Education, Suicide Prevention Resource Center, The Centers for Disease Control and Prevention (CDC) and UCLA School of Public Health, Community Health Sciences.